I want to send this email to say Thank You!!! Macy started with Sideline Spirit on August 31, 2015 in the Intermediate/Advanced Tumbling class starting her journey to becoming a Cheerleader. Macy was previously in Gymnastics as a little girl, but had never had any formal Cheer Training. In fact she never had any training in cheer at all. 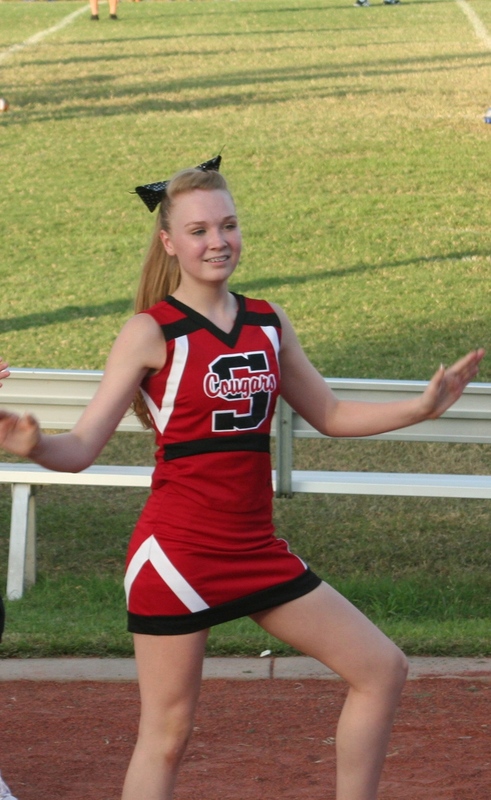 Her friend's Nadia and Kaitlyn were both in the classes, and Kaitlyn was currently on the Cheer Team at Knox Jr. High. They both pushed her to come take the class, and just like that we were on our way to a goal that certainly seemed unreachable. Laura, Macy's stepmom signed her up for the first class and she began taking the classes with Coach Rachel and loving them! She was able to progress at a fast pace due to the great coaching and will to succeed. During some point in the school year, Macy began listening to the doubters in her class that were current Cheerleaders and felt like she wasn't going to be good enough. We had a heart to heart about how it is an uphill climb due to the lack of cheer experience that she has had, but that when you really want something and work hard you can achieve the impossible. During this time we signed Macy up for the Dance class with Coach Tish, enrolled in Operation Tryout and First 15 when it came available. Coach Tish's Dance class was Awesome and Coach Rachel and the rest of the Sideline Spirit Team and their great work at the Operation Tryout and First 15 brought Macy a ton of confidence. The week before the tryout we had private lessons with Coach Rachel and with continued hard work and dedication practicing with Kaitlyn and Nadia, she was ready for the tryout at Knox Jr. High. On March 11th, my Birthday and wearing #41 during her tryout (My Age Now), we checked the website and Macy had achieved what herself and her doubters thought was impossible. She is now an official member of the 7th Grade Knox Cheer Team with her best friend and (student coach) Nadia. We are so proud of her and her accomplishment! For a young girl, this milestone will certainly aid in her confidence in becoming a young lady. We truly could not have done it without the Awesome Coaches and Owner at Sideline Spirit Cheer. Ashley, you have created something very special and we will always be grateful. It must be such an amazing reward to provide the tools to help these young girls achieve their dreams. Beyond the Sidelines: Sew Your Spirit! Bentley Lankford is truly a cheerleader at heart, she came into the world 14 weeks early (at a fierce 1lb 14oz) and stayed with her twin brother in the NICU for 3 months. It is from that stay that has developed a giving heart, she is a creative girl and loves to SEW. At 5 years old she started making small pillows and blankets that she would donate to the NICU that cared for her at birth. This Christmas she delivered 14 blankets for the babies in the NICU, they were the perfect size for the tiny babies that were spending their holidays in the hospital. In October of 2014 she decided to take on her first big sewing project, she wanted to make cheer bears for the girls in her class and the coaches at Sideline Spirit. She searched Pintrest for ideas and finally had a picture of what she wanted to make, Bentley sought out some help from her Great Aunt who is an amazing seamstress and who helped with modifying the pattern and the embroidery but in the end Bentley sewed 12 skirts, 12 shells, 12 bloomers, her mom pitched in to help with the project making 24 pom poms and 12 bows. It was a huge undertaking for this 7 year old but the excitement of giving them to her Sideline friends we truly worth it. Bentley continues to sew blankets in her free time, is currently working on some doll clothes and is taking classes in the Spring on how to read patterns so she can design & sew her own clothes. This month’s Beyond the Sidelines story is featuring S! student Avery Collazo. Avery is a Klein Collins cheerleader and has been training with Coach Ashley and Sideline Spirit for nine years. Avery loves Sideline Spirit and Coach Ashley for being a positive role model in her life, and for teaching her to be a positive role model to others, on and off the field. Avery also has a passion for volunteering and is a member of Legacy League. Legacy League is a Mother/daughter volunteer organization that strives to improve the quality of life within the Klein community through volunteer work. Most of Avery’s volunteer work is performed at the Abandon Animal Rescue. The Abandon Animal Rescue is a no kill animal shelter that provides care and adoption for animals that do not have a home of their own. Avery spends many days during her summer and afternoons during the school year volunteering at the shelter and has over 45 hours this year. Avery continues her volunteer work at home by fostering kittens that are not old enough or healthy enough to live with the other cats at the shelter. When Avery is not cheering or volunteering you might find her at the stable! She loves riding horses and spending time with her friends at Northside Christian Church. 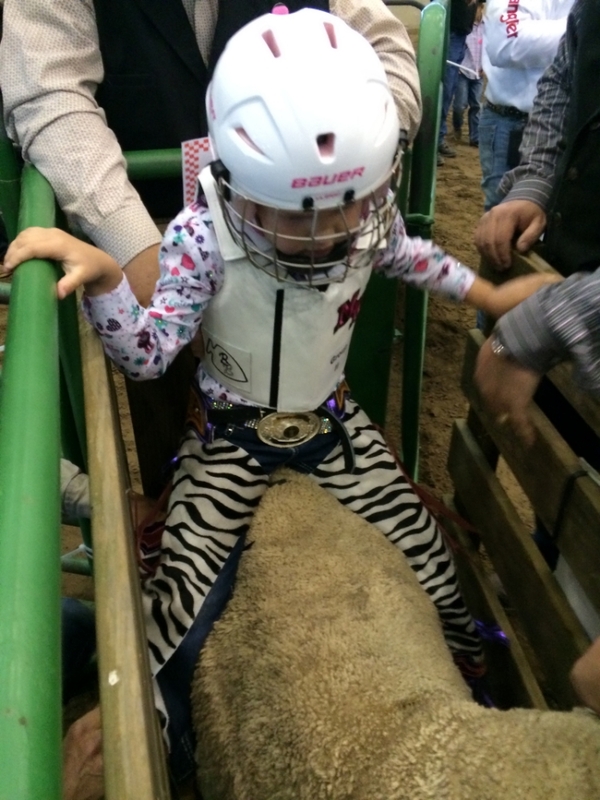 Beyond the Sidelines: The Rah Rah Rodeo Sweetheart! This month's Beyond the Sidelines story is featuring S! student, Myla Wagoner!! Myla is a very busy second grader. Not only does she tumble at Sideline and cheer for the AAYFDT Klein Sweethearts, she also competes in the Houston Live Stock Show and Rodeo! Myla has always been very active in the agriculture world by competing in stick horse races, mutton busting, and showing livestock. 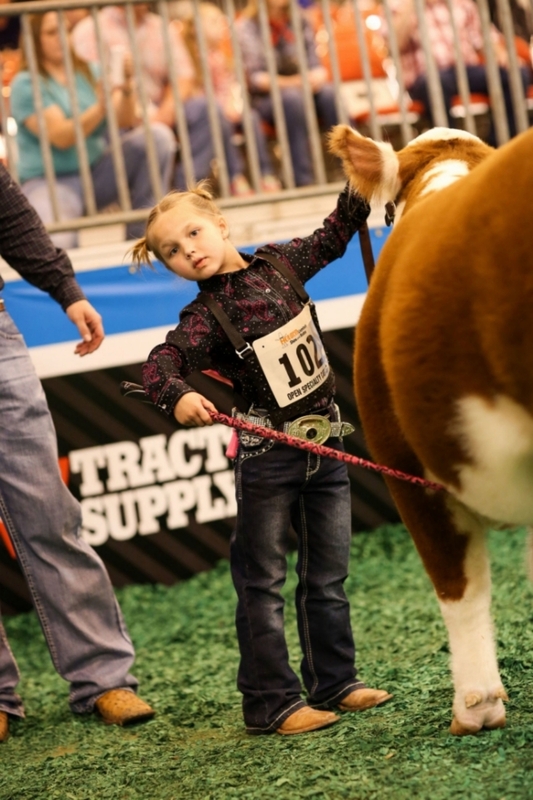 Myla received her first heifer for Christmas in 2013 and showed the heifer (named Peyton) at the Houston Livestock Show and Rodeo in March of 2014. Myla placed 1st in her class and won the Summer Intermediate Heifer division in the Miniature Hereford Open show! When Myla is not cheering, she spends her days at the barn working with her heifers. These animals require hours of work to ensure they are well mannered and fitted (groomed) correctly for show. An afternoon at the barn includes catching & haltering the heifers, working with the heifers so they will walk with you on a halter, training the animal to set its feet in the correct position for show, bathing, brushing, and drying them with a special hair dryer, called a blower, just for cattle. More time gets spent on the heifer’s hair than most cheerleaders spend on their own hair! Myla currently has 2 heifers-- a miniature Hereford and a Simmental. Myla just received her second heifer this week! The new heifer is a red Simmental, and since the heifer is red and sweet Myla named her peppermint! The mini Hereford was recently bred and had its baby on Halloween. Myla named the calf Boo. Beyond the Sidelines: When Hardwork & Determination Pay Off. My name is Allison Knodle. I am 13 years old and I have been cheering for 2 ½ years. When I started cheering, I was in the first grade and it was just an after school thing that I did once a week. Fast forward to 6th grade when I saw a girl that I knew selling t-shirts at Future Cougar Night (I attend Strack Intermediate and the cougars are our mascot). The girl's name was Avery Collazo and I met her at summer camp the year before. She told me that she was there for cheer. I thought, if Avery , who is pretty much a role model to me, can do it, why can’t I? So that’s when I started cheering again. Initially I attended classes at a competitive all-star gym for a few months, but they weren't really for me. Then, I found Sideline and never left! That was January of 2013, my 6th grade year. When tryouts came around, all of my friends made the team, literally! However, I did not and was shocked. So many people quit cheer after they didn’t make their teams, but I decided that I wasn’t going to be one of them. I started doing off campus P.E. at Sideline Spirit, training a minimum of 5 ½ a week. Sometimes I just stayed for other classes because I didn’t want to leave. I kind of lived there. Despite how often I was training, I still panicked about tryouts. I got my back handspring January 16, 2014 - 11 days before my set goal which really made me think I had a chance this year. But shortly after, my wrists began hurting, so I got wrist braces- the worst thing I’ve ever done. The pain grew worse and worse and as tryouts neared, I knew that I would have to wear my braces at tryouts. Everyday tryouts drew closer, I became more and more nervous. By Wednesday, the week of tryouts, I had the material memorized and on point. That particular day, all tryout candidates were to participate in a mock tryout in which we would be required to perform the tumbling pass that they planned to throw at tryouts. My heart raced as I waited in the tumbling line. I threw my pass and fell on my knees - but no wrist pain. I threw it again, and then one more time and landed it perfectly. When I walked into my solo tryout on Friday (I went last in my grade) I knew that my hard work would pay off. At 9 o’clock on the dot, I saw my name on the list of 8th grade Strack cheerleaders. Ever since then, I’ve been so proud of myself for what I’ve done and what I am going to do. We had cheer camp in August, which I couldn’t have been more excited about, and I was captain for the 2nd football game. So, it’s going pretty well with cheer, and everything is going to be ok… which life has already proved to me. How did you prepare for cheer tryouts? I took 5-6 classes a week at Sideline for a year including a tryout prep class called Spirit Bootcamp. I also participated in First 15 and Operation Tryout - tryout prep events at Sideline. What is your favorite aspect of cheerleading? What is your most embarrassing cheer blooper? At our first game this year, I was so nervous that I kept forgetting the motions and how many times we do a cheer and I was really embarrassed. Describe what it means to be a cheerleader. We are a team. We are role models for younger students and we cheer on teams at sports events as well as serve our community. How has cheer shaped you as a person? Cheer has taught me how to work harder than I have ever imagined to get where I want to be. I have also learned that there is no limit to what you can achieve.